A chapter on “The Synoptic Jesus and the Law” considers how serious the legal issues discussed between Jesus and his opponents would have been, had they been authentic. 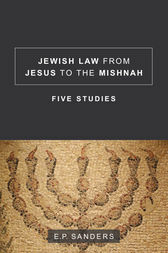 Two chapters explore whether the Pharisees had oral law, and whether they ate ordinary food in purity (the thesis of Jacob Neusner). A study of Jewish food and purity laws in the Greek-speaking Diaspora bears on the particular point of law which led to the argument between Peter and Paul at Antioch. At last, Sanders turns to a pointed essay that sets his own approach to rabbinic traditions and the Mishnah in distinct contrast from that of Jacob Neusner. A new preface points to the enduring contribution of these compelling and influential studies.